Forestry Degree Programme was started in Dr.Balasaheb Sawant Kokan Krishi Vidyapeeth, Dapoli in the year 1985. ICFRE, Dehradun and ICAR, New Delhi has accredited the forestry education and has awarded A grade to the College. They are supporting forestry education in by providing financial assistance to help develop and upgrade infrastructure. 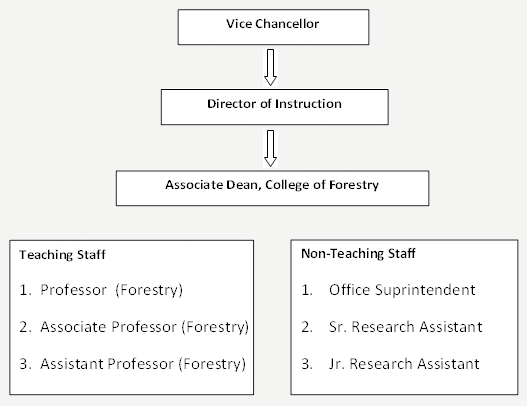 In order to improve and standardize the forestry syllabus at Under Graduate/Post Graduate levels, B.Sc. / M.Sc. (Forestry) syllabus is adapted as endorsed by ICAR, New Delhi and ICFRE, Dehradun. The curriculum at Bachelor’s level seeks to develop a forester equipped with basic understanding of dynamics of forests through regeneration, growth and extraction. Disciplines like Silviculture and Agroforestry Forest Biology and Tree Improvement, Forest Product Utilization, and Natural resource Management form the core of this programme. In addition, advanced techniques in tree breeding, physiology, mensuration, remote sensing, management, marketing, legislation, extension etc. are imparted through interactive learning through lecture and practical. The students are also imparted implant training for the entrepreneurship development in forestry sector and forest work experience. The entrepreneurship development modules include Production and Marketing of Quality Planting material, Cultivation and Processing of Medicinal Plants and Natural Resource Management (Ecotourism). At Master’s level, the forester is turned into a profound thinker on key aspects of forestry sector. They are specialize in Medicinal and Aromatic Plants, Plantation Technology, Environment Management, Forest Genetic Resources and Agroforestry. Their projects deal with on-ground problems of forestry sector.Students are trained during the degree program in different research institutes, NGOs, forest department and forest-based industries. They go through rigorous work experience in collaboration with Forest Department. At Master’s, they develop skills in project formulation and implementation, research methodology, data analysis, communication etc. apart from their field of specialization. Offering B.Sc. (Forestry), M.Sc. in Forestry degree programmes with students intake of 32 and 7, respectively. B.Sc. (For.) degree programme is offered with 34 courses (86 credits) in different disciplines of Forestry and 15 courses (34 credits ) in agriculture and allied disciplines with total credit load of 163 hrs. The undergraduate students offers Entrepreneurship Development / Forest Work Exp during the final year having 40 credits. M.Sc. (For.) degree programme is offered with 55 credit hours containing 20 credits in Major / core courses, 6 credits in supporting courses, 9 credits in specialization, and 20 credits in masters Research in addition to 9 credits as compulsory non credit e courses. Facilities for imparting teaching to undergraduate and post graduate degree program the college had developed facilities viz. Biodiversity Park on 50 ha comprising of more than 150 plant species, Mist chamber and Nursery unit which produces around 1 lakh seedling of 50 different tree and several MAP species, Block Plantation of different timber tree species and multipurpose tree species, Bamboo museum having collection of 19 species, different Agro forestry Models suitable for the region, Charak Medicinal Plants Garden having 183 species and Forest Products Processing Center which facilitates value addition of MAP and is approved by FAD department. Laboratory facilities with state of art instruments is available in the institute which includes Super Critical Analyzer, HPLC, Universal Wood Testing Machine, UV Spectrophotometer, Global Position System (GPS), Field and tracking equipments, Tree Canopy Analyzer, Portable Leaf area meter, Flame photometer. These instruments are being used by the faculty and students for conducting quality research work. The college has developed following laboratories / facilities for imparting teaching to undergraduate and post graduate degree programmes. The College library is in possession of good numbers of text books, journals and periodicals, audio video media used for teaching and instruction purpose. The computer facilities is open for students wherein the information can be retrieved through CAB abstracting services, NET, CD- ROM etc. Number of Text / Reference Books available is 622, Number of Periodicals subscribed – 8, Educational media / CD-100 and CABI / E Resource CD-upto 2008 is available. Academic building is connected with internet connectivity through LAN. The hostel has wi fi net facility along with internet connectivity.